There are two categories of iMac which concern us here, as the old white models are not economically repairable anymore. That leaves the modern thin edged ones with no DVD slot, and the older thicker ones with a DVD slot. In this article I'll discuss what repairs can be made to each type and costs to repair each iMac. How can I identify which iMac I have? What can and can't be repaired on the older iMacs? How much does it cost to repair an older iMac? 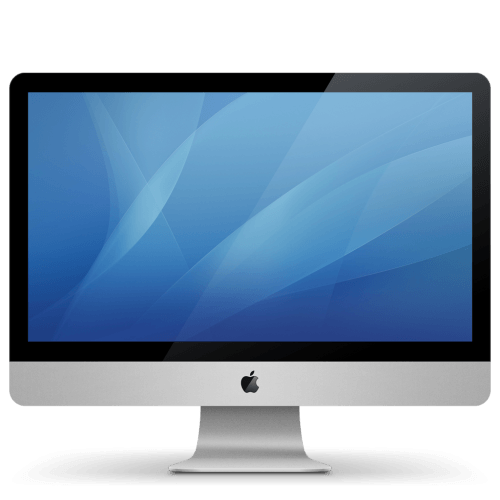 What can and can't be repaired on the newer iMacs? How much does it cost to repair a newer iMac? What about the fans and temperature issues that I've read about? There are a few differences which will identify which iMac you have and what can be repaired. I have categorised these as "older" and "newer". If you have an iMac which is white it is not going to be economically repairable. These "older" iMacs are still great machines and well worth repairing and upgrading. A notable exception is the 2011 27" iMac which had graphics issues from new and was part of an Apple repair programme. Unfortunately that has ended now and this model is a write off if it has graphics issues. Support for general performance issues is not a problem. These are just some common faults that can and can't be repaired. The list is not definitive. The key point is that graphics issues cannot be repaired as the graphics cards are not available. This is a very common problem with 2011 27" iMacs and unfortunately there is no proper solution. Your hard drive can be replaced with either a conventional hard drive or a Solid sate drive (SSD). An SSD is a much faster option and is generally a worthy upgrade. Bear in mind that parts prices do vary slightly but these won't be far off the mark. If you send me a message quoting your serial number I can give you an exact price. if your iMac is running slowly or taking ages to start up, this can normally be resolved with housekeeping of the operating system and possibly upgrading the RAM or fitting an SSD. This work is generally carried out in your home or office and should be complete in an hour or so. Costs are between £95 and £125 depending on the work involved. Parts are charged for in addition to this fee. Though generally none are needed. RAM or memory is related to your iMacs capacity to do work. If you are running short on RAM your iMac will run slower. This is often the case with older iMacs as newer operating systems and software require more RAM. labour costs are £110 which includes a full tune up & speed up service. These prices are for RAM made by Crucial which is of the highest quality and specifically designed for Macs. There are other cheaper options but I do not recommend them. I often have used RAM which has a 3 month warranty and is half the price of new. To be honest there is virtually nothing that can't be repaired on these newer iMacs. They are pretty bullet proof too. A great and worthy machine to repair or upgrade. The early 21.5" model had issues with the hard drive fitted from new which often failed after a couple of years. This can be easily replaced or upgraded to an SSD which transforms this model particularly. Unfortunately both the 27" and the 21.5" iMacs are glued together with special tapes that cost £25 to replace. They have to be replaced every time the iMac is opened for repair. There are cheaper ways of doing it but at the cost of not being able to open it again without breaking the screen. Most "cowboy" repairers use the cheap option - I will not. Labour cost for all models is £125 which includes a full tune up & speed up service. So £125 + £25 for tapes = £150 service charge for all models. In addition a temperature sensor is required when replacing hard drives on the 27" iMac. This is NOT required on 21.5" iMacs. The extra £50 is for 27" iMacs only. Example: To fit a 1TB hard drive to a 2015 21.5" iMac = £150 + £50 = £200 in total. Your iMac has 4 slots for RAM and probably only uses 2. You can therefore add an 8GB kit and boost yourself up to 16GB in total. labour/materials costs are £110 which includes a full tune up & speed up service. I specialise in the repair of these later iMacs and many people in the trade use me for this service. It's not for the faint-hearted and requires the right skills, tools and materials to repair these iMacs. I would suggest being very cautious of cheap repairs on these models. It often ends up being a very expensive disaster. Either at the time or next time someone tries to open your iMac. All iMacs after 2008, with the exception of the "newer" 21.5" models, require an additional temperature sensor to be fitted when replacing a hard drive. I say "require" but there is another method that involves software to control the fan speed. I would caution against using this method and will not use it on repairs I do. Once again "cowboy" repairers often cut corners here to reduce costs. As you can see most problems can be solved economically on an iMac. The one exception is the graphics issues which plague the older models. There are also several upgrades which can be done that will hugely increase performance. These are worth considering whilst your iMac is being repaired. If I can help you with a repair or support, you can click the button below to make an appointment.